The ominous sounds of horns and violins start to fill your ears, the screen goes black and out of the rippling water emerges a gruesome creature. You try to run but the only thing you can do is spin and hope the slot gods bless you with some luck. 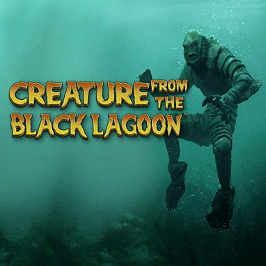 Yes, you've guessed it, you're now the star of the Creature from the Black Lagoon online slot game. Just like the 1954 horror movie classic, the Creature from the Black Lagoon by NetEnt is filled with sights and sounds that immerse you in a world where danger lurks in the watery abyss. However, unlike the hapless heroes in the movie, you've got a way out and that way out involves bets, bonuses, free spins and more. However, before you can tussle with this slot's eponymous monster, you need to know a few basics. 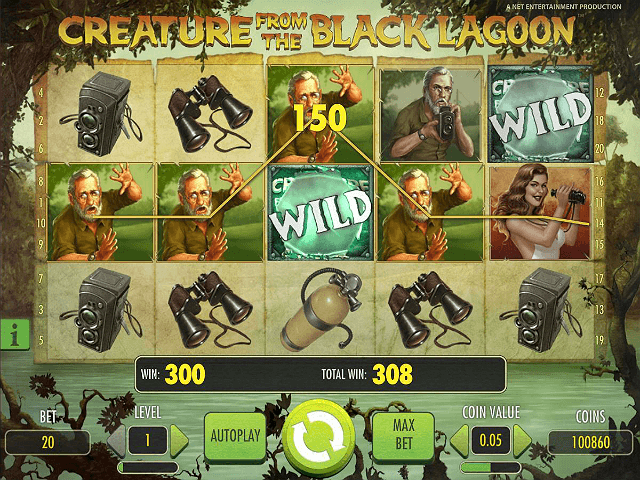 In this Creature from the Black Lagoon slot review, we'll give you all the important highlights as well as a few special features that should help you win more and evade capture! This video slot is part of NetEnt's retro movie series. 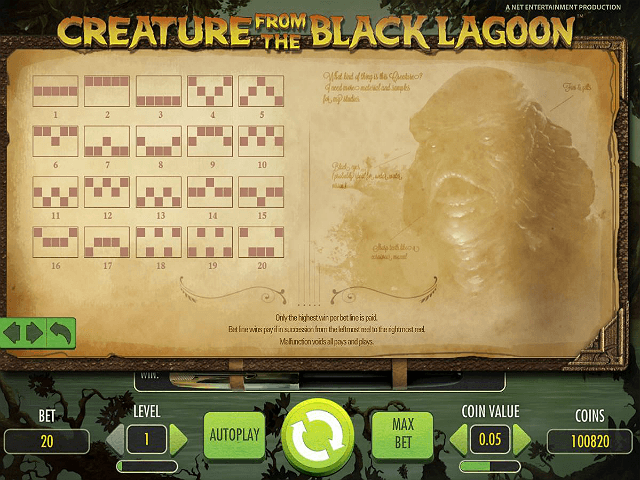 Similar to the Invisible Man and Dracula, the Creature from the Black Lagoon online slot machine features images and animations from the 1954 movie. Thanks to a licensing deal with Universal, the game kicks off with a video sequence that wouldn't look out of place in a cinema and, by the time you start to spin, you'll notice that everything is designed to entertain. The melodic soundtrack features heavily in the background. Then, as you start to spin, vintage video camera sounds play as the five reels click into place while bubbling swamp noises add an uneasy feeling to proceedings. This online slot's betting limits start from 0.01 credits per line which, when you multiply that by 20 paylines, means you'll be betting £0.20 per spin. As for the max bet, you can adjust the coin value to 0.05 and the level (i.e. coins per line) to ten, which will take your overall stake to £100 per spin. Regardless of the level you play at, Creature from the Black Lagoon jackpots and payouts are based on your line bet. At the lowest level you can win four times your bet, while the top jackpot is 750 times. Triple Wilds: This game has three "spreading wilds" that not only substitute for any other symbol, but lock in place and give you one free respin each time they appear. Free Spins: Three or more free spin symbols will earn you between ten and 20 free turns of the reels. To add to this bonus, target symbols can appear and give you more free spins or add some spreading wilds to the mix. 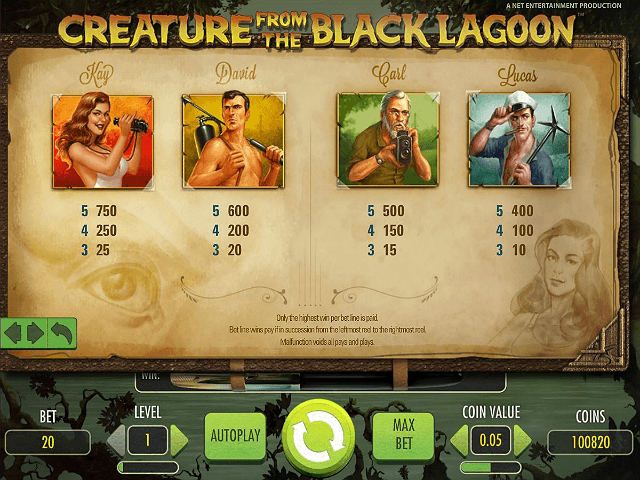 Creature from the Black Lagoon by NetEnt is one of the most entertaining video slots around. Full of colour, action and, of course, ways to win, this game is a must-see for any movie slot game lover out there. If you like Creature From The Black Lagoon - You'll like these slots too!